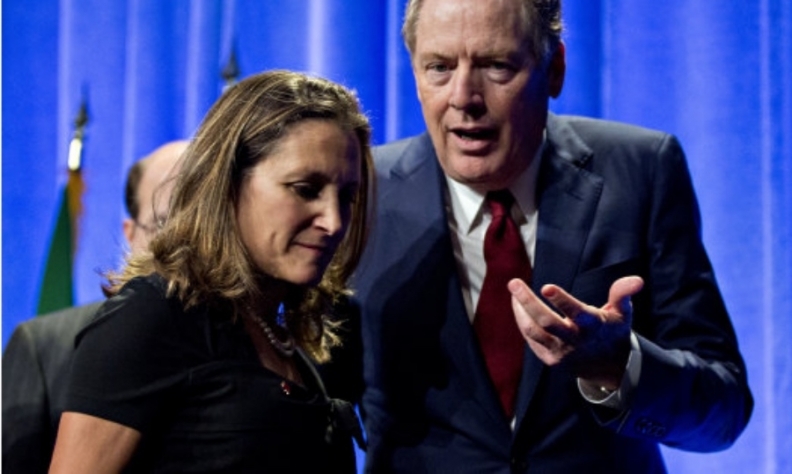 The U.S. and Canada continued to look for ways to bridge their differences as talks resumed to update the North American Free Trade Agreement, with Ottawa insisting it won’t sign a bad deal. A spokeswoman for Lighthizer didn’t respond to a request for comment. The two nations remain at odds over a handful of core issues. They include anti-dumping dispute panels contained under Chapter 19 of the current deal, which the U.S. wants to remove and Canada wants to keep, and Canada’s protected dairy sector, which isn’t in the current deal but where the U.S. wants concessions. Another point of contention is cultural industries, where Canada is seeking to preserve an exemption. Intellectual property and pharmaceutical patents are among other issues. White House economic adviser Larry Kudlow said on Friday in an interview that it’s “m-i-l-k” that continues to block a deal, while Freeland later downplayed that, saying Kudlow isn’t at the negotiating table. U.S. President Donald Trump has threatened to proceed without Canada, and to apply auto tariffs to the country, if a deal can’t be reached between the nations to update Nafta, which took effect in 1994. Prominent members of Congress have warned the Trump administration that it can’t proceed under its current fast-track path without a trilateral deal -- in effect, saying Canada must be a part of a deal -- but the Trump administration has argued that it can.